Yoga as art: that is the concept with which Tripsichore Yoga Theatre has been captivating audiences around the world. Tripsichore skillfully creates narratives by choreographing routines using beautiful poses and movements influenced by various styles of yoga, especially vinyasa. The use of yoga techniques on stage by the groundbreaking group has resulted in beautiful, unique performances. After experimenting with a variety of dance styles like ballet, conventional, and modern, the group decided to incorporate their yoga training into their actual performances; the potential was immediately evident. The fluid movements of the different yoga postures easily conveyed and expressed important themes to the group such as harmony, spirituality, and bliss. Vinyasa Yoga in itself is very fluid and sometimes called “flow yoga” because of how easily the movements segue into each other. Because Tripsichore Yoga employs many vinyasa yoga movements, it makes sense that these dance-like sequences of poses could be turned into art narratives that convey stories. The Sanskrit meaning for vinyasa is “connection,” which is appropriate since the movements are often aligned with one’s breathing, moving from one pose to another on an inhale or exhale. The transition between poses is very graceful, which is why it is compared often to dance. Using these fluid movements as a form of art, Tripsichore is also able to connect to audiences and those who seek to learn the routines. Tripsichore Yoga Theatre is a London-based group founded by Edward Clark. Clark has been studying yoga since 1978. His background in dance and experience with Ashtanga Vinyasa and Iyengar is clearly reflected in the group’s live performances and other routines. According to Clark, theatre and dance are alike in that the job of the performers is to fill the stage, however large that area might be. Tripsichore does this by applying the basic techniques of yoga and turning them into beautiful works of performance art that reach out to every member of the audience. The group experiments with movements and techniques, which is how Tripsichore Yoga has been able to come up with such compelling routines. Basic techniques and movements are the core of the performances, but fresh ideas and the openness to experiment make this interpretation of yoga so unique and fun to watch. If you haven’t seen Tripsichore yet, or you have but you would love to relive the experience, you don’t have to travel far. In fact, you don’t have to leave your house at all, because Edward Clark hascaptured the power of some of these performances and brings them to you, along with training techniques and workshops, on the acclaimed 2-disc DVD set, Tripsichore Yoga. 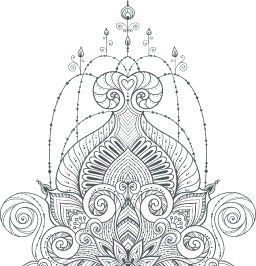 Pranamaya is pleased to bring you a less traditional form of yoga that is a great complement to your current yoga routine or an excellent entryway into a modern interpretation of the practice.